TWSF has been checking out the local farmers markets recently. Last Saturday we went to the market in Courthouse and came home with the best blackberries I've ever seen (they tasted like a margarita for whatever reason), strawberries, and a free-range chicken (it's sitting in the freezer, we'll be cooking it this Sunday). Last night, I walked to the farmers market by the Ballston metro and came home with a box of new potatoes (to be mashed on Sunday with the chicken), cherry tomatoes, 3 ears of corn, a large loaf of fresh ciabatta, and an oversized blueberry muffin, all for $11. Typically, farmers markets aren't that cheap. I happened to get a good deal last night on everything, but you pay for high-quality fresh food at these markets. Those blackberries I spoke of, $6 for a container, and the strawberries $7. It was worth it, you wouldn't find that quality at your local supermarket. Anyways, after my farmers market trip, Chuck and I met up for a bike ride (I finally got a new bike and it is AWESOME!!!!). Since this was the first time either of us have exercised in a while, we needed a filling, but simple to prep dinner. We decided to take advantage of the fresh ciabatta and make paninis! 1. Take out that Panini maker (or your George Forman from college.) If you don't have either, you can make this in a pan over the stove just as easily. 2. For each sandwich, slice ciabatta bread in half. On each half, place 2 slices of fresh mozzarella. 3. 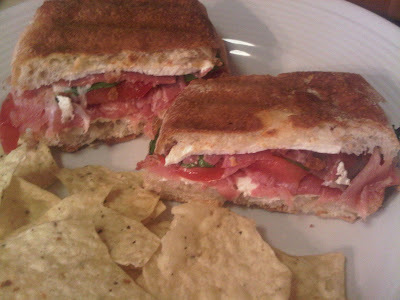 On one half of each sandwich, place 2-3 slices of prosciutto, 3-4 basil leaves, 2-3 slices of tomato, salt and pepper. 4. Put sandwich halves together and put in the Panini maker or George Forman until the cheese is melted. If you don't have either gadget, cook in a pan over the stove as you would with grilled cheese. Use another pan to hold on top of sandwich, to give it that flat, Panini effect.